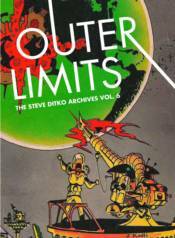 Outer Limits: The Steve Ditko Archives Vol. 6 finds Ditko in his early artistic prime and features more than 200 meticulously restored, full-color pages. This volume's stories are heavily weighted toward the science fiction genre and includes an introduction by series editor Blake Bell as well as meticulous documentation of Stan Lee calling Ditko back to Marvel to begin the Silver Age of Marvel Comics.